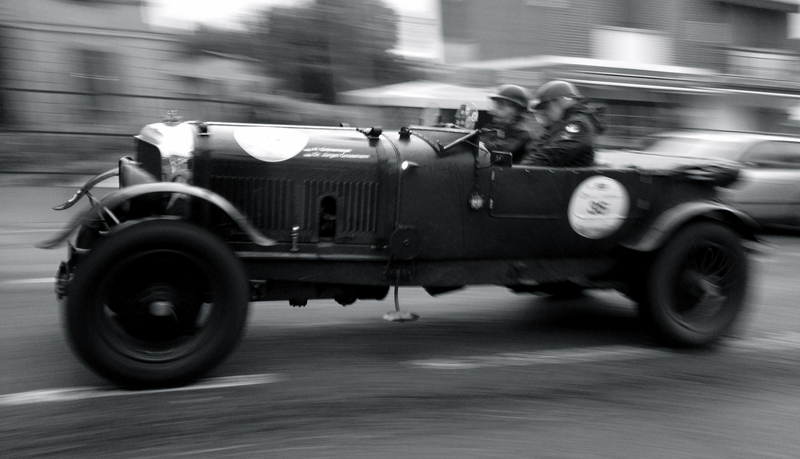 Germans Jurgen Grossman and Herbert Gronemeyer wrestle their 1927 Bentley through Moglia, during the 2013 Mille Miglia. Are they talking about the cars, the competitors, or the route? Probably all three. I followed the race again this year, over much of its distance. Here are a few of my favorite photos that I took, which to me illustrate the point about the Mille Miglia’s beauty. 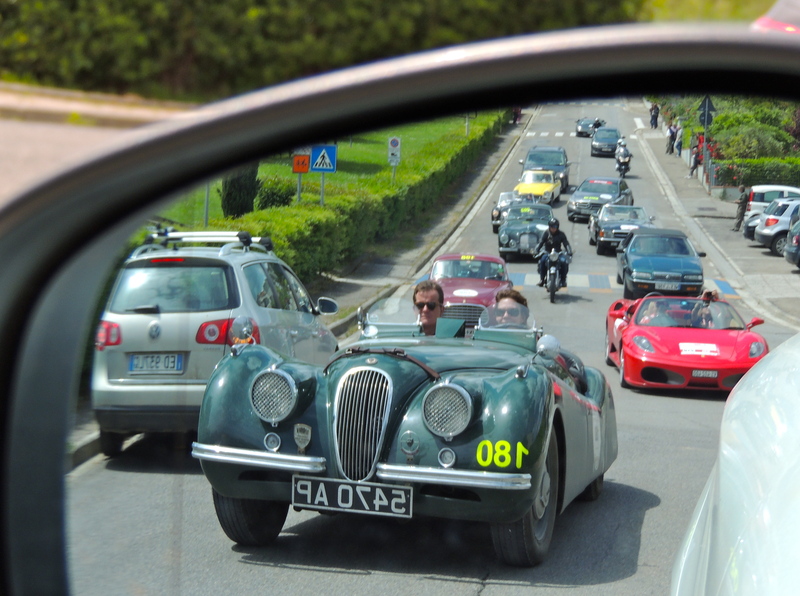 The view from my rearview mirror – the Mille Miglia is conducted for the most part on public roads that remain open to the public – creating some fabulous traffic jams! 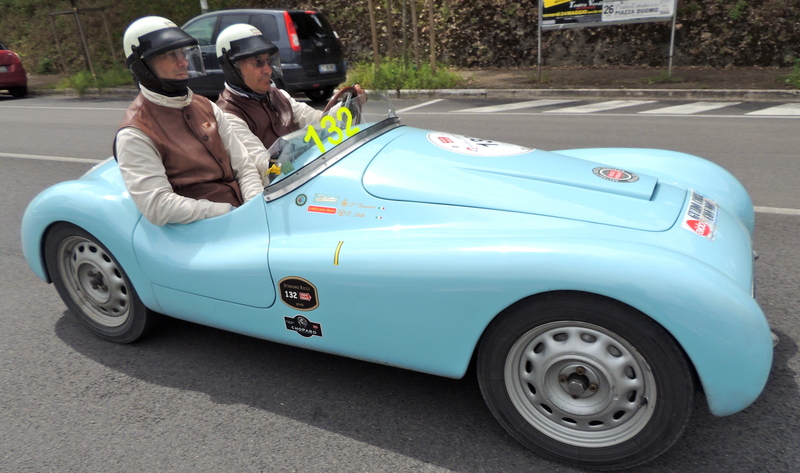 The cars start from Brescia, the ancestral home of the Mille Miglia. Legend has it the town folks were upset, back in 1926, at the prospect of losing the Italian Grand Prix to Milan. So they decided to host their own race. Italians Ezio Sala and Pietro Bonomi are big guys! They barely fit in their 1938 Fiat 500 A Sport. They look a little vulnerable to the elements – it rained almost the whole way! They wanted to make it a major test of man and machine, so they decided on a 1,000-mile race. Why 1,000 miles? After all, isn’t this Italy, where they measure road travel in kilometers? Well, they do today. But in Roman times, they measured a “mile” in terms of how far Caesar’s legions could march in 1,000 paces. That has worked out to about 4,851 “feet”! 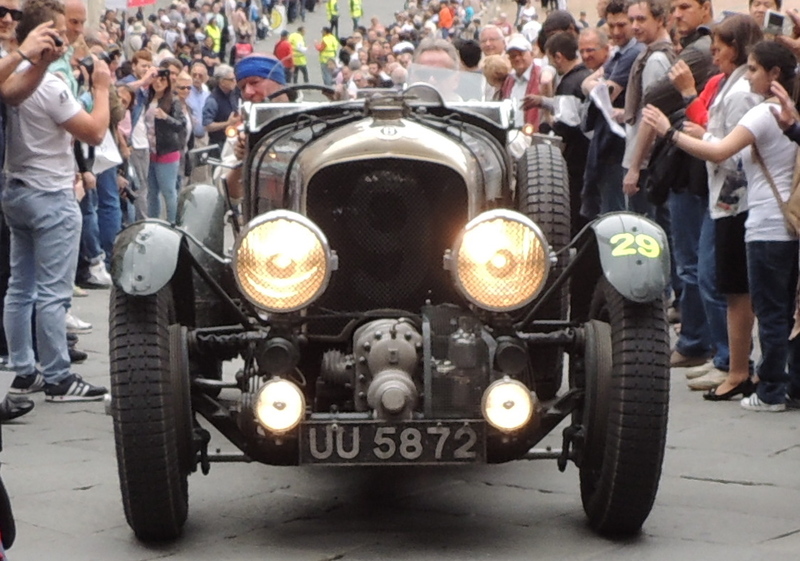 Rolf Frech of Great Britain, with German co-driver Jurgen Zollter, maneuver their 1929 Blower Bentley through a gauntlet of well-wishers in Siena’s Campo. So, originally the race was 1,000 Roman miles. But then it evolved into 1,600 kilometers – or about 1,000 statue miles. Also in the backs of organizers’ minds was the idea that the Mille Miglia would be twice as long as the Indianapolis 500. A drive through the Ferrari headquarters in Maranello is a highlight of the race. So that’s how the distance was set. The course has been something else, over the years, with minor – and sometimes – major variations. Basically, it goes to Ferrara from Brescia, down to the principality of San Marino, on to Rome and then back up through Umbria, Tuscany, Emilia Romagna and back to Brescia. The whole thing now takes parts of four days. Sir Stirling Moss did in 10 hours once – back in 1955 – setting a racing record that will never be broken. Although the all-out road race discontinued after 1957, the tribute rally has continued on – with machines from the era 1927-1957 – and it is still a test of man and machine. A rather glorious one to see. 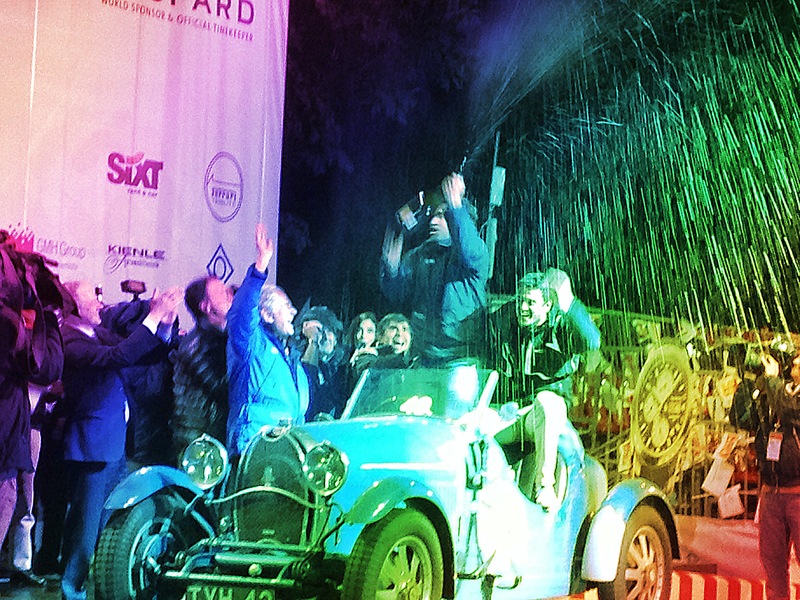 Congratulations to the winners, Juan Tonconogy and Guillermo Berisso of Argentina, and their speedy little 1927 Bugatti T40. 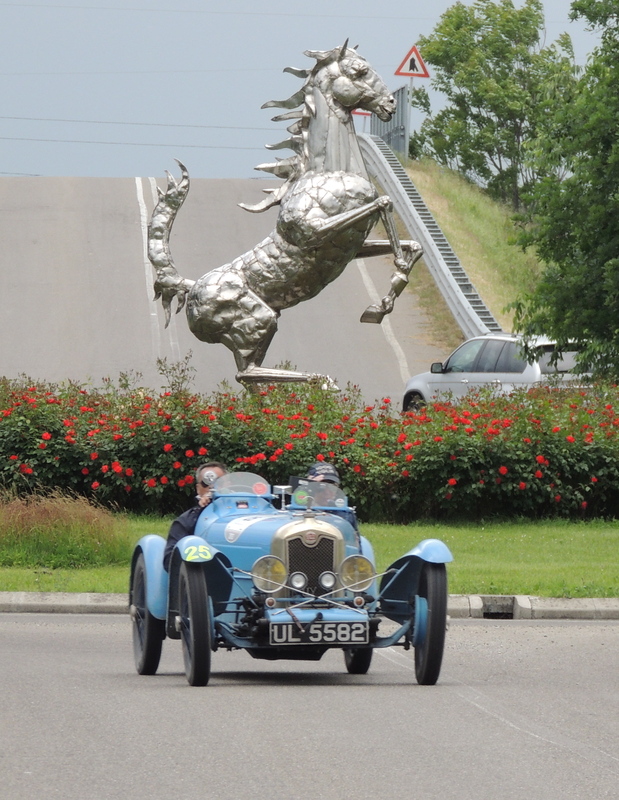 It actually competed in the very first Mille Miglia, back in 1927. All hail to the winners!